There is a Web site training August 5th & 6th at the Synod Center. Best wishes to the outgoing members of the Blantyre Synod Management team in their new responsibilities. All are moving on except Rev Maulana who continues as General Secretary. At the Bi-Annual Synod meeting that took place between 22-25th August 2011, the Synod chose General Secretary, Rev. 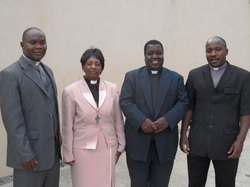 Alex Maulana, a new deputy General Secretary, Rev Cliff Charles Nyekanyeka, and a new Vice Moderator, Rev. Andrew Kamponda. Rev. M. Chilapula was elected as Moderator for a second term. A group of young people from the Protestant Church in the Netherlands (PKN) is visiting Malawi from 6th until 25th August 2012. After a memorable safari trip to South Luangwa in Zambia they came to Saint Michael and All Angels Presbyterian Church (CCAP) in Blantyre. The group leader is Rev Lieuwe Schaafsma, who has been an Associate Minister of Saint Michael’s from 2001 to 2009. He preached on Sunday 12th August 2012 in the English service and introduced the group to the congregation. After the service the congregation showed their welcome with a handshake at the exit of the church. The names are: Hanneke van Amerongen, Jurian and Annette Bakker; Annemarie Born; Marianne Born; Jeroen Bunck; Florianne Duim, Johan Evers, Jan and Adriaan van Kooten; Danielle van Veen, Aukje Schaafsma, Anne-Marye van Woudenbergh. The group was split in two parts. Seven people worked in the shelter for the disabled named Tidzalerana in Ndirande. The name stands for: “Let us care for one another”. The other group worked in Mulanje Mission Hospital, painting the Nthuwe Hostel for male nurses. The value of the trip is not only that the work makes a difference, but the contacts with other Christians and society in the African setting is mutually beneficial and encouraging. The group will be hiking up Mulanje Mountain, the highest mountain in Southern Africa with its 3000 metres. Before they leave the country they will be spending a few days at Lake Malawi. Recently the St Michael and All Angels Men's Group held a conference on the subject of 'Restoring the Masculine Soul'. The conference was focused on putting the teachings and commands of the bible into practice in one's life. More detailed information may be available soon. The following an abbreviated and edited version of conversations between the Blantyre Synod Website Editor and Rev Lieuwe Schaafsma of the Protestant Church in the Netherlands. Editor: Please tell us a little bit about yourself, why you are in Malawi and what you are doing here. Rev Lieuwe Schaafsma: I am a minister in the Protestantse Kerk in Nederland (PKN) or the Protestant Church in the Netherlands. For ten years I was in Malawi. I am now back in the Netherlands near Amsterdam. Right now however I am leading a team of Dutch people on a trip to Malawi. E: I know that you speak good Chichewa. What were you doing here? Were you a minister with a CCAP church congregation? LS: I was the Director of TEEM (Thelological Education by Extension in Malawi). We were teaching a diploma to enable people to go on and study at university and so that they can progress on to a masters in theology. Students studied Old Testament, New Testament, Church History, Systematic Theology, African Traditional Religion, Christian Ethics, Islam and Missiology. We were with the GZB, which is a mission board within the Protestant Church in the Netherlands. The GZB is evangelical and concerned with mission and evangelism, we are linked with the CCAP in Malawi. E: What does GZB do in connection with Blantyre Synod? LS: There are three things: TEEM, orphan programs and Zomba Theological College. E: Would you recommend that foreign visitors come and visit or attend CCAP Blantyre Synod church services? As you know we have many many services in English as well as in Chichewa. LS: I preached many times at churches in Malawi outside of the CCAP when I lived here. However, the CCAP services give you contact with the real people of Malawi and their church. It is the people's church. Here you are in touch with the real Africa. My choice would be to worship at a CCAP service in Blantyre Synod unless invited elsewhere for a specific purpose. E: What would you say of the standard of teaching and preaching on Sunday in Blantyre Synod? LS: Sometimes I am very impressed by the standard of preaching coming from elders. Many do not have the benefit of fifteen years of full-time study - there are economic pressures. If you find somewhere where you do not like something then try elsewhere. Blantyre Synod is very large and an overseas visitor will very soon find somewhere that is good for them. Like other large church denominations there will be a broad spectrum between different ministers and elders. E: Thank you very much for your time. May you wish you and your team all the best in their work with the orphans residence in Ndirande and with Mulanje Mission Hospital. We have here a link to the English language page of the GZB in the Netherlands. The mission co-ordinator is Mr Arie vander Poel. Also referred to in the interview was the Zomba Theological College and their website is here.